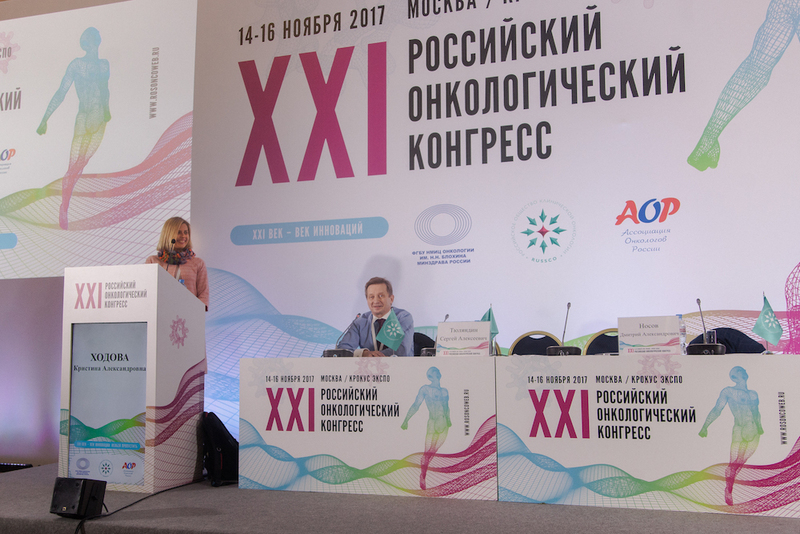 A cooperation agreement between the Russian Society of Clinical Oncology (RUSSCO) and the Foundation for Cancer Research Support (RakFond) was signed on November 16, 2017, within the framework of the XXI Russian National Cancer Congress. The agreement establishes the conditions for cooperation between organizations, including: organization of joint events, research grant competitions, and other initiatives to support and promote basic, applied, translational and clinical research in the field of oncology, as well as implementation of joint projects, preparation of publications, and development of international cooperation. The signing of the agreement took place during the annual general meeting of RUSSCO members. RakFond’s Founder and Chair of the Board of Directors, Christina Zakurdaeva, gave a presentation on RakFond’s mission, strategy, and tasks. She called the cooperation with the most successful organization uniting clinical oncologists in Russia to be both a great honor and a significant responsibility. In her speech, Christina emphasized that RakFond’s main assets are the people whose united efforts will make it possible to achieve Foundation’s ambitious goals. She specifically addressed the unique composition of Foundation’s Scientific Advisory Board, which consists of leading Russian and international oncologists. The Board was created to establish RakFond’s research priorities and maximally objective evaluation of scientific projects. Chairman of RUSSCO, Professor Sergey Alekseyevich Tyulandin, praised the importance of creating RakFond as an instrument for supporting the oncological science and noted that oncologists themselves frequently become leading donors of such initiatives. This was confirmed by the results of fundraising during the Congress: 500 thousand rubles, received from participants’ registration and sale of RUSSCO-branded merchandise decorated with the emblem of scientific research support, will be used for the first joint research grant competition, which will be announced in early 2018.